Cecilia is the heart of Linwood Meadows. 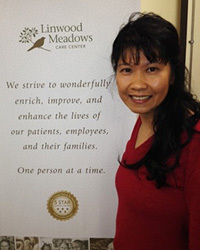 She has been with Linwood Meadows Care Center since 1994 (almost 20 years!). She started out as a floor nurse and quickly was promoted to be a Nursing Supervisor 1 year later. In early May 2013 she became the Director of Nursing. She always knew she wanted to become a nurse from the time she was a child. The memories of her cousins taking care of her grandfather helped her see just how meaningful caring for the elderly can be. After these inspiring experiences, Cecilia knew what her calling was and that was to be a nurse and help take care of the elderly who have done so much for us. Cecilia loves coming to work and seeing the smiles on her residents’ faces, or family members expressing gratitude for the care that was given towards their loved ones. Cecilia has a loving husband and 4 kids (2 beautiful daughters and 2 dogs which if you asked her, she would say they count as her kids as well)! She enjoys camping and spending time with her family and friends.